Like Guinevere and Lancelot, this pair creates an aura of romantic intrigue that is hard to miss. As cordial and charming as Guinevere, Venus in Libra has a queen-like ability to gracefully receive love, affection and praise. With innate subtlety, Venus in Libra understands what it is to be loved, and gravitates towards environments that support and sustain the pleasures of the heart. Mars in Leo is a natural Lancelot, and as a knight in shining armor, he is ready to offer up any number of generous offerings to prove that his heart is in the right place. 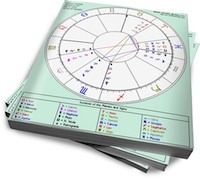 Dramatic, bold, warm and entertaining, Mars in Leo will do anything to please his queen. This easy interplay of Venus in Libra’s air and Mars in Leo’s fire creates an ongoing chemistry that is gentle and unforced. These two have no trouble in sustaining the connection between them. Venus placed in Libra loves to relax and indulge, and Mars in Leo thrives on providing an ever-expanding menu of pleasurable experiences to enjoy. The more Venus in Libra appreciates what Mars in Leo provides, the more Mars in Leo is motivated to give. Venus in Libra also knows just what Mars in Leo needs to feel like the king of the beasts, giving him exactly the right amount of praise and encouragement, and devoting herself to his ongoing happiness and comfort. This dynamic duo loves to entertain and socialize, sharing their ability to enjoy good times with friends. The only real challenge this combo faces is the tendency to sometimes get stuck on the surface of relationship dynamics, shying away from deeper emotional waters. But if they can try to take the risk to occasionally dig down to the bottom of potential challenges, they will avoid any drama and conflict that may await them. thank for this series. please doe venus in sag with mars in cancer.